Chester – The highly imaginative, prideful Orange tabby who loves good literature and milk. He was given to Mr. Monroe as a birthday present, and the name "Chester" was derived from G. K. Chesterton. In addition, apparently a cartoon series based on the books have also been made, appearing on Cartoon Network and Boomerang, and the character who voiced "Chester" was Sean Astin. I always find it interesting to see references to GKC in such diverse places. We know what is meant by saying that the Church is merely conservative and the modern world progressive. It means that the Church is always continuous and the heresies always contradictory. Military men are seldom militarists. We shall never return to social sanity till we begin at the beginning. We must start where all history starts, with a man and a woman, and a child [...] As it is, we begin where history ends, or, rather, where disjointed journalism ends. We stop suddenly with the accidental truncation of today's news; and judge everything by the particular muddle of the moment. Ours is a sociology of snapshots; and snapshots always fix human figures in postures not only silly but stiff. In modern times we have had a vast increase in the sort of education that the ignorant can impose and a vast decrease in the sort of instruction that only the instructed can provide. The politician, who merely declares that so many thousand copies of such and such standard works shall be distributed to such and such schools, is in that exact sense an ignorant man. The agricultural labourer, who shows his son how to use a pruning-hook, is in that exact sense a learned man. Mr. Archer does not seem to understand laughing at one's own ideals. If our ideals have once endured our laughter they can endure all the laughter of our enemies [...] Being funny has nothing to do with being untrue or undesirable. I think it funny to put food into one's mouth; but I have no intention of discontinuing the habit. The sort of sentiment I want the politicians to study, not without tears, took some such form as this: "Beware of Luxury, the eternal enemy of Liberty." The old friends of freedom never tired of insisting, in what seems to some a turgid and florid manner, on the necessity of simplicity in the life of a champion of the people. The pleasures of the court were for the courtier. The tribune must know nothing between the field and the forum [...] one truth, vivid to every friend of freedom a hundred years ago, has now become a blind spot on the brain. It is no longer Liberty against Luxury, but Liberty for the sake of Luxury. The result is a corruption that eats out the heart of representative government. It is simply an unchanging quality in the nature of man that he is fickle, moody, and one-sided; that he stresses now one point in morals and now another, neglects one virtue and then goes on in progressive triumph to neglect another; that he is overpowered by whatever is recent and generally ignorant of what is remote; and, above all, that he mistakes experience for existence, and supposes that what he sees is all that there is to see. There certainly is in human nature this changing quality; and it is an unchanging quality. A self-conscious simplicity may well be far more intrinsically ornate than luxury itself. Indeed, a great deal of the pomp and sumptuousness of the world’s history was simple in the truest sense. It was born of an almost babyish receptiveness; it was the work of men who had eyes to wonder and men who had ears to hear. For after all, blame is itself a compliment. It is a compliment because it is an appeal; and an appeal to a man as a creative artist making his soul. To say to a man, "rascal" or "villain" in ordinary society may seem abrupt; but it is also elliptical. It is an abbreviation of a sublime spiritual apostrophe for which there may be no time in our busy social life. When you meet a millionaire, the cornerer of many markets, out at dinner in Mayfair, and greet him (as is your custom) with the exclamation "Scoundrel!" you are merely shortening for convenience some such expression as: "How can you, having the divine spirit of man that might be higher than the angels, drag it down so far as to be a scoundrel?" When you are introduced at a garden party to a Cabinet Minister who takes tips on Government contracts, and when you say to him in the ordinary way "Scamp!" you are merely using the last word of a long moral disquisition; which is in effect, "How pathetic is the spiritual spectacle of this Cabinet Minister, who being from the first made glorious by the image of God, condescends so far to lesser ambitions as to allow them to turn him into a scamp." It is a mere taking of the tail of a sentence to stand for the rest; like saying 'bus for omnibus. It is even more like the case of that seventeenth century Puritan whose name was something like "If-Jesus-Christ-Had-Not-Died-For-Thee-Thou-Hadst-Been-Damned, Higgins"; but who was, for popular convenience, referred to as "Damned Higgins." But it is obvious, anyhow, that when we call a man a coward, we are in so doing asking him how he can be a coward when he could be a hero. When we rebuke a man for being a sinner, we imply that he has the powers of a saint. Those modern theologians who insist that Christianity is not in doctrines, but in spirit, commonly fail to notice that they are exposing themselves to a test more abrupt and severe than that of doctrine itself. Some legal preliminaries at least are necessary before a man can be burned for his opinions; but without any preliminaries at all a man can be shot for his tone of voice. For though to-day is always to-day and the moment is always modern, we are the only men in all history who fell back upon bragging about the mere fact that to-day is not yesterday. I fear that some in the future will explain it by saying that we had precious little else to brag about. Pride is not only only an enemy to instruction. Pride is an enemy to amusement. The main lesson of St. Francis of Assisi is this idea of an almost fantastic self-effacement corresponding to an almost fantastic pleasure. [...] melancholy is a frivolous thing compared with the seriousness of joy. Melancholy is negative, it has to do with trivialities like death: joy is positive and has to answer for the renewal and perpetuation of being. Melancholy is irresponsible; it could watch the universe fall to pieces: joy is responsible and upholds the universe in the void of space. A man should be always tied to his mother’s apron strings; he should always have a hold on his childhood, and be ready at intervals to start anew from a childish standpoint. Theologically the thing is best expressed by saying, “You must be born again.” Secularly it is best expressed by saying, “You must keep your birthday.” Even if you will not be born again, at least remind yourself occasionally that you were born once. Just as a follow-up to an earlier post, here is a picture of the then Princess Elizabeth's sitting room at her home Clarence House (about 1950), in which hung on the wall the preliminary sketch for Sir James Gunn's "The Conversation Piece", featuring G.K. Chesterton and his friends Hilaire Belloc and Maurice Baring. It is located to the right of the fireplace. The future Queen replied on 16 December to offer "our most sincere thanks for the delightful picture of Mr. Chesterton, Mr. Belloc and Mr. Maurice Baring...I think it perfectly charming, and much look forward to hanging it in my house." The picture, incidentally, is from the book Clarence House by Christopher Hussey (1950), from the plate opposite of p. 76. It is also the picture which appeared on the dust jacket (albeit the dust jacket of the edition I recieved was, naturally, not in as great of condition as the picture in the book itself, so I chose to use the latter). There was a Victorian epoch when the caricaturists were supposed to caricature the politicians. Now the politicians are caricaturing their own caricatures. Hence it will probably be found that all our ablest artists, in this manner, will grow more and more frantic and farcical, more and more incredible and crazy. They are trying to keep pace with our statesmen and social philosophers. The aim of good prose words is to mean what they say. The aim of good poetical words is to mean what they do not say. The decay of society was praised by artists as the decay of a corpse is praised by worms. The modern world is full of fantastic forms of animal worship; a religion generally accompanied with human sacrifice. Yet we hear strangely little of the real merits of animals; and one of them surely is this innocence of all boredom; perhaps such simplicity is the absence of sin. I am not certain we have wholly gained by losing liberty, equality, and fraternity; and substituting, for the first two, a strange blend of license and uniformity; and for fraternity, only peace. The greatness of Homer consists in the fact that he could make men feel, what they were already quite ready to think, that life is a strange mystery in which a hero may err and another hero may fail. The poet makes men realize how great are the great emotions which they, in a smaller way, have already experienced [...] The great poet exists to show the small man how great he is. Now this is the attitude which I attack. It is the huge heresy of Precedent. It is the view that because we have got into a mess we must grow messier to suit it; that because we have taken a wrong turn some time ago we must go forward and not backwards; that because we have lost our way we must lose our map also; and because we have missed our ideal, we must forget it. I believe less in the State because I know more of the statesmen. I believe in the universal extension of rights, but not in the universal extension of privileges. As one can tell from the title, it is associated with "Princess Elizabeth" (who is, of course, now Queen Elizabeth II). It was published in 1935, and was a collaborative effort of many famous authors of the day in producing a book intended as a fundraiser in aid of the Princess Elizabeth of York hospital for children. The Queen was 9 (I think) at the time of its publication, and doing some Googling, I read somewhere that it was the first book to which she had set her name. I also read that Rudyard Kipling wrote the last story he was ever to write as his contribution to the book (He died the next year, if I recall correctly). THIS sumptuously produced and beautifully illustrated volume contains "all ye need to know" about the home of Princess Elizabeth and the Duke of Edinburgh (and that is perhaps more than loyal curiosity could have expected to be told about the borne of the Heir Apparent fifty years ago). 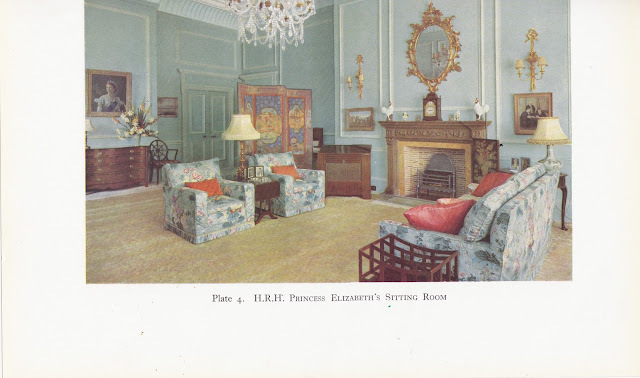 Feeling rather like an inquisitive intruder on visitors' day, the reader is allowed to peer at the contents of most of the rooms in great detail—from the photographs on Princess Elizabeth's desk to the sensible fireguard in the nursery. The house has been furnished with unostentatious good taste, and is filled with treasures of all kinds. One of the few things a diffident visitor might be doubtful about is the brick-work in Her Royal Highness's sitting-room fireplace. Nearby hangs James Gunn's sketch for his "Conversation Piece" of Chesterton, Belloc and Baring: there are many other works by modern artists on the walls, and also an interesting Edinburgh scene by Alexander Nasmyth (1758-1840).